We create tools that help funders, advocates, creatives and other leaders to collaboratively strive for social justice. 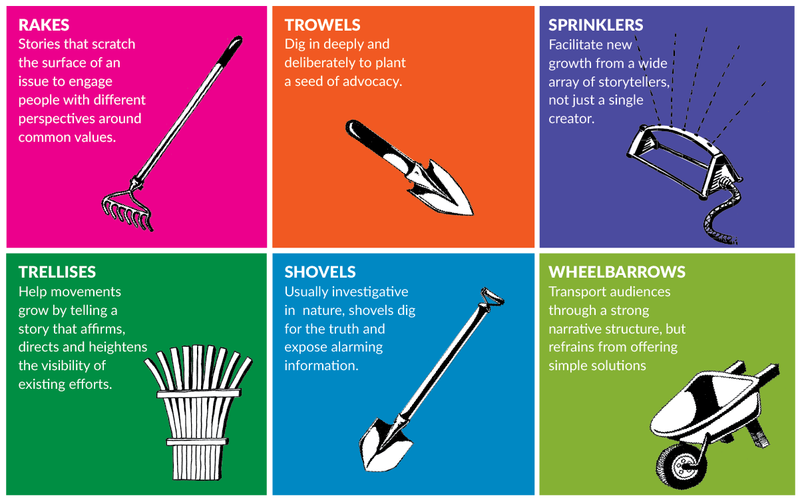 Active Voice Lab’s tools clarify the many ways that creative content can make a difference. They’re designed so that media makers, funders, and advocates can all contribute what they do best. Practical suggestions for making sense of how the impact of creative media can -- or should -- be assessed and maximized over time. Workshops, presentations, and guidelines that identify common issues and propose solutions to help partners work together more effectively. “What Would It Take?” A blueprint for peer learning and media funding aimed at our most urgent issues, based on promising practices and lessons learned the hard way. Active Voice Lab distills trends based on decades of hands-on experience using television, movies, digital, and place-based storytelling to contribute to social movements. Our hand-picked network of experts keeps us on the right track and the cutting edge. Let us help you heighten the impact of your media-fueled initiative, your grantmaking, or your story-based project. Working closely with your team, we can bring seasoned knowledge to your existing strategy, or create an interactive ACTivate plan that helps you align your objectives, partnerships, and distribution. A resource that allows media makers, funders and allies to communicate more effectively — and what questions to ask about impact along the way. Believe Us, We’ve Seen it All!